My earliest memories of art are times with my grandmother back when I was seven or eight years old. She decided to take some private painting lessons for fun and invited me to join her. That sparked a passion. My grandmother and I spent lots of time over the years under the tutalage of various local artists until I went off to college and she eventually passed away. If only she could know the lifelong gift she gave me! I was originally a watercolor artist and, thinking I needed to come up with a way to make a living with my art, studied architectural rendering in college. After college I freelanced for a few years, until I got married and had children. Art took a back seat until my youngest started school. It was then that I began to study oil painting and fell in love with the medium and painting again. Over the years, my subject matter has included a little bit of everything, but I consider myself primarily an impressionist landscape painter. Almost without exception, my paintings have an architectural point of interest, whether a Chicago street scene or a big red barn. Equally important to me is a dramatic light source. Eward Hopper comes to mind first because his work has an architectural bent and light plays such an important role in creating drama and interest in each of his paintings. Joaquin Sorolla is another painter who I love because he was a master of light. 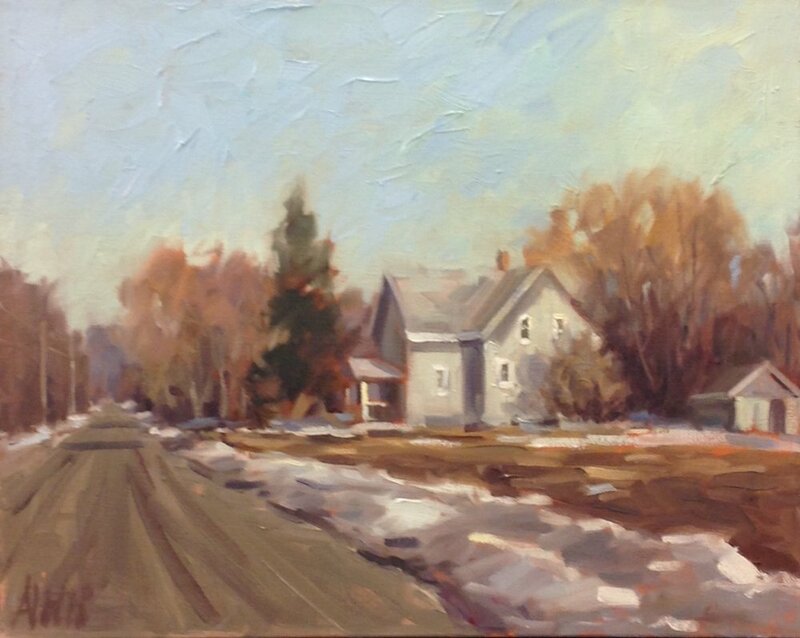 Of course, I have studied the work of many contemporary painters and am especially drawn to plein air artists because of their spontaneous brushwork and their ability to capture light and its effects. I have some limited plein air experience, but for the most part, my paintings are created in the studio. For me, that has meant taking lots of photographs for inspiration. I project my photos on a big screen monitor when I am drawing or painting so I feel like it is the next best thing to being there. I love the spontaneity of alla prima painting (wet into wet), and that is what I strive for, but sometimes it takes me more than one try to get the brushstrokes or color I am after and I end up scraping or wiping off until I am happy. The idea is for each painting to look effortless and painterly, but I have to admit, sometimes it takes a few tries! You describe yourself as an impressionist painter. How did you come to paint in this style? My natural inclination is to make everything “too perfect” in my paintings, most likely a result of my architectural rendering days. This is something I fight constantly because I think art is more interesting if the viewer has to fill in with his eye. Hence, my focus over the years to paint in a looser, more impressionistic way. I would also say that my interest in light and its effects lends itself to impressionism. 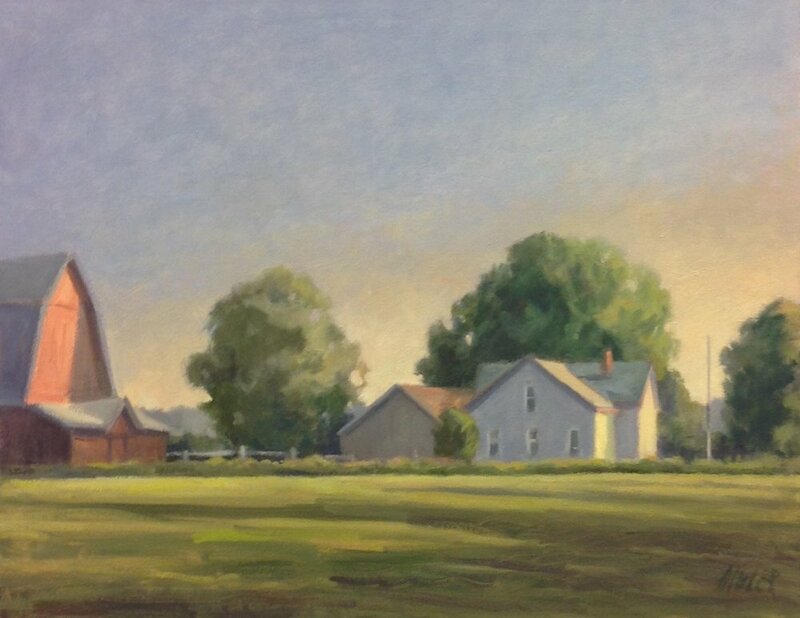 You paint city scenes, rural scenes, and still lifes. Can you talk a little bit about your interest in each of these? Over the years my subject matter has varied, but because I am a representational painter, I am limited to what is around me. I have found that painting in series works best because I am able to explore the subject matter in more depth. Currently I am painting midwest landscapes. These are “quieter” paintings than most of my previous work and the challenge for me is making the larger shapes in- teresting and varied. I have always said, the hardest thing to paint is “nothing” - whether it is a blue sky or a field of grass or the background of a still life. I hope to get better at that.